Beth has something like a urinary tract infection going on. The urinary tract thing has been driving her crazy for days. She’s tested positive for both the BK virus and also the CMV virus. My understanding is that both of these are very common, and wouldn’t be a problem for folks who have normal immune systems. But it’s also common for folks who have had transplants (and the related immunosupression) to have to fight off these viruses. So she’s back in the hospital, and they’re treating this with “aggressive IV fluids”. She’s already had an ultrasound on her kidneys, and everything there appears to be fine. Beth’s white blood cell count this morning was 2.89; that’s the highest it’s been in months. And that’s the type of thing that’s going to let her fight off any infections that come her way. The biggest challenge right now is the mucositis. She had gotten Kepivance both before the chemo, and after the transplant, in order to thicken the lining in her mouth, esophagus, and GI tract. I believe this was to prevent mouth sores, which are caused by the chemo. However, she’s been dealing with this the last few days — the thickened lining “peels off”, and in her case, it hasn’t entirely prevented the mouth sores. So she’s fighting both the sores and this peeling lining. (Though she has, at the insistence of the nurses, continued to try to eat things like jello, cottage cheese, and pudding). Her blood pressure remains elevated, her legs and feet remain swollen a bit, mild fevers (below 100 F) continue to come and go. And while these things are annoying, they seem to be subsiding as well. One of the resident doctors came in this morning and explained some of what seems to be going on with the persistent fevers. They’ve done lots of tests and blood cultures, and one of the probable sources of infection — the catheter — has been ruled out (so far the “cultures” they took from the piece they removed are negative). There seems now to be a higher and higher probability that the infections (and the fevers, which come and go with regularity) seem to be introduced through her gastro-intestinal (GI) tract. One of the major side effects of the chemotherapy is something called mucositis, which manifests itself in the form of sores in the mouth and evidently all through the GI tract. Since she has no current immune system, bacteria from the environment (food, drinks, etc.) are making their way through her GI tract, and into lesions caused by mucositis. This is a pronounced-enough effect that a significant portion of pre- and post-transplant treatment involves the administration of “Kepivance”, which is supposed to cause the body to produce a coating within the GI tract, and it has worked — she really does have a coating, and no mouth sores, but that’s no guarantee of no small lesions throughout her stomach and intestines. The primary symptom, I guess, is the fact that she continues to have fevers, even though they are continuing to administer the strong antibiotics, vancomycin and cefepime. And so, if this is the case, the fevers will continue to come and go through the next few days, until there is some “engraftment” and she begins to produce white blood cells, some 10-12 days after the transplant. (The transplant was on the 14th, so days 10-12 will, at this point, straddle Christmas). With the production of her own white blood cells, the fevers and infections should “resolve themselves”, but until then, we are here. The bottom line is that she can’t go home until she has gone 24 hours “off antibiotics and fever-free”, which obviously, at this point, hasn’t happened. But the trade-off, as the Doctor said, was that right now, she is giving up one Christmas at home, in order to have many more in the future. We’ve been told the stem cells are due in to the hospital at or shortly after 9:00 tonight. 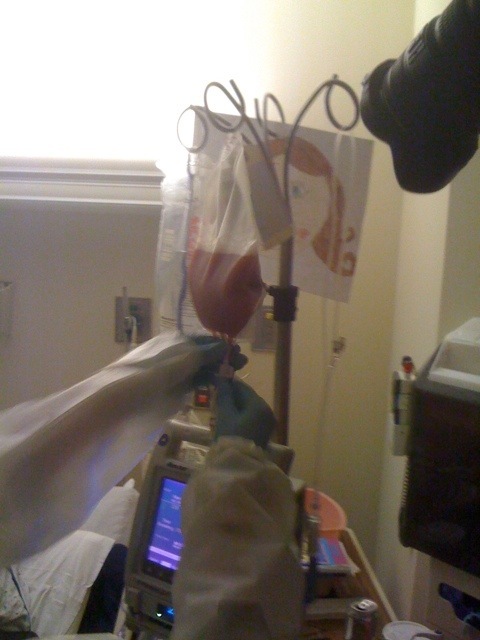 The bag of cells is very small, and will only take about five minutes to infuse into her. This is the moment we have been waiting for all these months. From the bottom of our hearts, we want to thank all of you who have helped us in any way to get here.